Thread: What Are You Buying This Month (March 2019) ? Also got myself a Weller WS81 soldering set. Long time ago I bought a too cheap soldering station, and while it has gotten the jobs done along the way, I regretted from day one not buying a Weller. Now the old one is giving up the ghost - literally falling apart - and I have a reason to get what I should have bought all along. There's a lot of new digital soldering stations out there on the market these days, but I picked the analog WS81, which has served me well at work for decades. It's brand new, and I'm sure it will outlast me. My 2nd Shay and a couple of European Steam Engines (and token European switcher). Shays are always so expensive but this one was a decent deal at $90 shipped. The 0-10-0 Fleischmann had one driver pair that was super locked up -- not sure what got in there, maybe Loctite that someone put on the screw that was next to it? 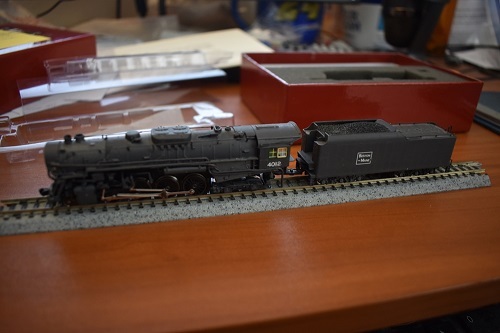 Anyway, liberal use of CRC 2-26, disconnecting driver set so I could spin it separate from the others, and more elbow grease than I usually like to apply to n-scale engines and I got it spinning freely and re-quartered. Green 0-8-0 runs nicely, Black 0-8-0 motor is having some significant issue (may have melted commutator or windings so not sure if I can bring the motor back to life or if this unit is destined to be a display unit until I randomly pickup a replacement motor). The little Lima 4f that came w/ the other European Locos is having its shell stripped since it had a really bad paint job and I would rather start from scratch -- unless I get lucky and I can strip it down to original paint, seems like it might be slowly going that direction (was painted black and seems to be green under that). Tender-drive motor runs pretty well -- lightening speed -- considering it is an old Lima Pancake motor. Shays are really nice, and I always liked the BR94 - your 0-10-0 steamer. I had one in H0 back in those days. Try the Weller at 370 deg or there abouts , I find that to be the best temperature. Last edited by Mac; 6th Mar 2019 at 05:06 PM. Train show. Got these cars and a few vehicles. Wow, that's going to make a nice rake. What's going to be at the headend ? Photo ?? Amazon acquisition: a tablet mount. Came with two sizes of tablet holders (larger is pictured below empty, smaller with a tablet installed). Quite happy overall aside from the smaller being a bit fiddly to get clipped into the mount itself. This one might seem familiar to many, as it was once part of the collection of one of our dear admins... who sold it to Moose2013 and has now been sold to me. For the price it was going for, I couldn't (correction: chose not to) refuse this beautiful custom model. "The Wabash & Eel River Railway: Midwestern railroading at it's finest." Here is my first round of purchases for the month. Two 4-slot car card holders from Precision Design Co. Nice kits that go together easily. Just remember to clean the soot of the edges. Next we have a few goodies I got online. The wood grade crossing is for a retail lumberyard that has a dirt compound around their siding and has a wood crossing for their forklifts to get on both sides of the cars they are unloading. The GHQ forklift kit and the N-scale Architect Job Site Office are for a lumber distributor. The Lifelike Hotel kit is fodder for Brewery Kitbash I am building. I recently built one of those. It's a nice kit. The plan is to scour the local model railway show this weekend, see what I can get for myself. Nice. I have a Bullied Pacific, myself, with more purchases planned. What are you buying this month (March 2018)? What are you buying this month (March)?